Air Conditioning @ Auto Motion Chatham Used Cars ON. 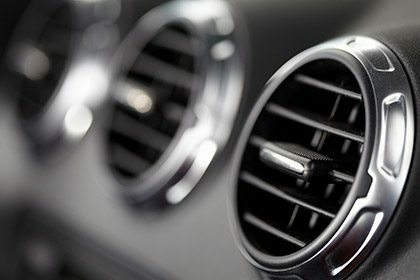 A regular car air conditioner service or regas will help to ensure optimum passenger comfort, particularly on those hot summer days when you need it the most. Contrary to what some people believe, an auto air-conditioner system does not simply blow cold air into the car. The Air-con system is actually designed to remove the hot air from within the vehicle cabin and dispel it to atmosphere outside the car. In order to do so, the airconditioner system relies on a number of components to operate effectively, such as the evaporator, condenser and compressor. Like all mechanical parts, these items are prone to wear and regular system servicing helps to protect them from breakdown. To help maintain the car airconditioner system it pays to run the system for a few minutes at least once a week – no matter how hot the temperature may be. This ensures that the many hoses, valves and pumps throughout the system are kept well lubricated. Whenever you have the car serviced, make sure you ask the mechanic to check the refrigerant level and regas the system if necessary. The Air conditioner is not always included in a standard log book service, so it can be easily neglected. It is good practice to get a full air conditioning service at least once a year. Try and do this before the hotter months start, as this will ensure that you are not caught out by a sudden heat wave at the start of the season. A car air-conditioning system can be a breeding ground for harmful bacteria and fungus. This is particularly important for sufferers of asthma or allergies. Your local Repco Authorised Car Service mechanic can provide you with information on special sanitizing treatments that can help to remove these contaminants. Here are some simple ways you can check on your vehicle’s air conditioning system periodically and be more proactive in recognizing any problems. Run the air conditioner once a week for about ten minutes. This will maintain gas pressure to keep the compressor working properly. When you do this, be sure to turn it to its highest fan speed and coolest setting. Run defrost mode for about five to ten minutes. This prevents mildew and cleans out excessive moisture, which can lead to unsavory odors in your car. Use your air conditioner in winter. In addition to cooling your vehicle, one of the air conditioner’s primary functions is to remove humidity from the cabin. It works especially well when you need to remove fog from the windshield to improve visibility. Re-charge your air conditioning system. Every two years refresh the cooling system with gas and lubricant. Get a full air conditioning service. Head to your local tire and service centre every two years before the hottest months of the year begin. Auto Motion is located in Chatham-Kent, Ontario and also serves Windsor, London, Tilbury, Sarnia, Kitchener, Leamington, Strathroy, St. Thomas, Tecumseh and surrounding areas.